The world's largest cocoa producing country recently witnessed its worst ethnic clash in several years. At least 60 members of the Guere ethnic group were killed in a tussle for control over the country's most fertile cocoa plantations. The attackers allegedly comprised the Dioula people from the rebel-held northern areas and the northern neighbouring countries of Burkina Faso and Mali. The Guere and Dioula have fought for control over the land for generations. Guitrozon, the site of the latest clash, lies on the edge of a confidence zone running through the country, which separates the rebel-held area from the rest of Cote d' Ivoire. Part of a 10,000-strong peacekeeping force, mostly comprising soldiers of the un and some French troops, man the zone . 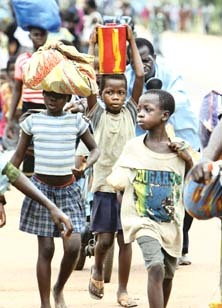 After the clash, thousands of cocoa farmers fled to the neighbouring town of Duekoue with their families. Duekoue's mayor Victor Tiehi claims at least 30 villages near the town had been abandoned and that the death toll had touched 103. Residents of the area allege that the Ivorian soldiers didn't do much to stop the massacre; some government authorities are even charged with having a hand in the killings. The un Security Council has called for an urgent inquiry into the crime. The ruling Ivorian Popular Front's parliamentary group has demanded the resignation of prime minister Seydou Diarra.